Found a home in a pantry in Tremont IL. 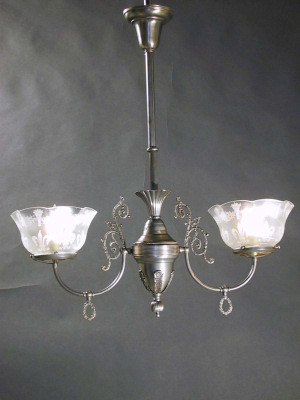 Circa 1885, this 2-Arm Gas Fixture has large cast arm backs with wreath Gas keys. The Deep Acid Etched Transfer Gas Shades has a torch and floral pattern. Applied floral castings on the body has a fluted ball on the bottom, fluted banding and a fluted tulip spinning above. 38" length x 24" wide.